A two-volume translation of and commentary on the Bhagavad Gita, offering a comprehensive examination of the science and philosophy of yoga. 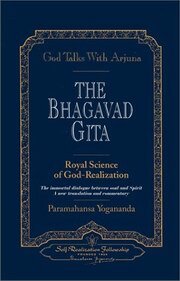 The author outlines the Gita's balanced path of meditation and right activity, and shows how we can create a life of spiritual integrity and joy. Among the world's sacred writings, there is perhaps none more universal in its appeal than the Bhagavad Gita. Through the centuries, its sublime and ennobling counsel has endeared it to truth-seekers of East and West alike. In this new edition, Paramahansa Yogananda offers a translation and commentary of wide scope and vision. Exploring the psychological, spiritual and metaphysical depths of the Bhagavad Gita - from the subtle springs of human action to the grand design of the cosmic order - he presents a sweeping chronicle of the soul's journey to enlightenment. Of all the Eastern scriptures, the Bhagavad Gita is the most widely known and best loved in the West. In this eye-opening translation and commentary, Yogananda unveils for the first time the deeper meaning hidden within its symbology.